Investor sentiment and the dreaded double-miss acted as cement blocks for Opko in August. Shares of biopharmaceutical and diagnostics developer Opko Health (NASDAQ:OPK) were absolutely decimated in August, falling 34% based on data from S&P Capital IQ. There were two primary culprits responsible for pushing share prices notably lower. To begin with, the stock market correction has been the bane of nearly all biotech stocks. Biotech companies usually lose money and typically aren't valued based on traditional fundamentals. Instead, emotions and forecasts play a role in formulating biotech valuations. In Opko's case, its stock had doubled since December, so it presumably had more to lose out of its valuation than some of its peers during this correction. 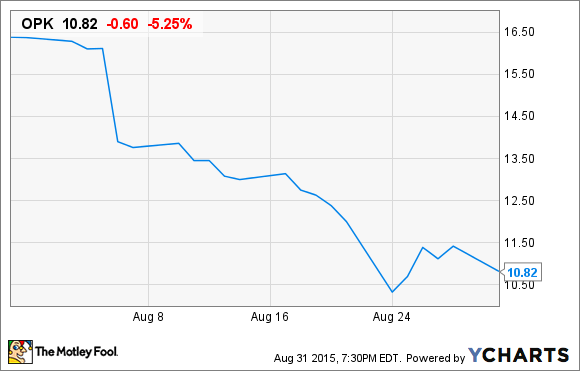 However, the bigger concern in August was Opko's second-quarter earnings report double-miss. As I said, earnings reports don't have a huge bearing typically for companies with a growing pipeline. But following Opko's rapid ascent that saw its valuation hit roughly $10 billion earlier this year, investors were expecting perfection -- and they didn't get it. For the second quarter, Opko announced $42.4 million in revenue, an 80% increase from the year-ago period, driven by collaboration revenue with new partner Pfizer. Net loss, though, went the wrong way and ballooned to $42.8 million, or $0.09 per share, from $25.5 million, or $0.06 per share, in the prior-year period. Increasing research and development expenses were mostly to blame for the wider loss. Comparatively, Opko's revenue was about $2 million shy of Wall Street's estimates, while its loss was $0.01 per share wider than expected (i.e., the double-miss). So what's the deal: Can you trust Opko stock here? Opko has certainly given investors ample reason to believe that its growth is about to accelerate in a big way. An upcoming PDUFA decision on rolapitant for the treatment of chemotherapy-induced nausea and vomiting could yield a favorable result; secondary hypoparathyroidism drug-hopeful rayaldee, for patients with stage 3 or 4 chronic kidney disease, is expected to get a thumbs up or down from the Food and Drug Administration by March; and the acquisition of Bio-Reference Laboratories should give Opko an impressive lineup of diagnostics related to cancer and women's health. Investors, however, are also aware that Opko is sporting a nearly $6 billion valuation, meaning a lot of these upcoming approvals, its acquisition of Bio-Reference Laboratories, and its partnership with Pfizer are potentially factored in. In other words, Opko's stock may not find traction until we see marked improvement in its bottom line. The long-term profit forecast seems to indicate eventual success, but it could be a bumpy ride along the way.